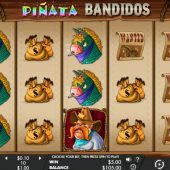 Piñata Bandidos slot is a rare thing from Genesis Gaming as it only has 10 pay lines, whereas most of their output is 40+ lines or multi-way. For example, their slot Lucky Dragon Boat has 50 lines and Rich Panda has 1024 ways! Going back to Piñata Bandidos, the literal translation is 'Pinata Bandits'. A Piñata being a papier-mache donkey full of sweets and treats that children beat with sticks until it breaks open to release its contents. Well, it's better than bullfighting I suppose. Does Piñata Bandidos slot have anything sweet in store for us? The 10 lines are played over a typical 5 reels and 3 rows and in keeping with the small amount of pay lines the symbols appear stacked up to 3 rows high. Naturally the game has an overlay of Spanish acoustic guitar and trumpet music straight from a Spaghetti Western to irritate you with and the symbols are reflective of the Spanish bandits and Piñata theme. The Piñata itself is the top-paying icon, which for some reason appears smoking a cigarette and pays 10x stake for a 5-of-a-kind win. There are then 2 bandits, one in the form of a strawberry with a machete between its teeth which pay 7.5 and 5x bet respectively. The remaining symbols are guns, wanted posters, cash bags and a Sheriff's hat ranging from 1.5 down to 0.9x bet. There are no scatters and the best hit is a screen of Pinatas paying 100x stake. There is a strange looking mustachioed Sheriff symbol on reel 3 which acts as the game's only Wild symbol. I say strange because he seems to have lost his Latin looks and sports orange hair and mustache, more reminiscent of the costumes sometimes worn by someone trying to impersonate a Scotsman. Anyway, as well as being a single non-multiplying Wild he will un-holster his revolver and fire at all the Piñata symbols in view, awarding cash amounts for each. If there are none in view you are given 4x bet, but otherwise the amount is usually between 5 and 20x stake. The amounts increase though with the amount of Piñata donkeys in view. 1-2 are paid at 0.5 bet each, 3-4 at 1x each and should you get 14 they are paid at 10.5x bet each, thus awarding the feature's highest pay of 147x plus the 10 lines of 5-of-a-kind Pinatas.